Baranof's collection of local commercial fisherman stories. There are a thousand ways to skin a cat, and a thousand ways to catch a fish! 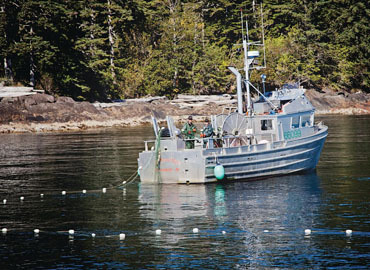 By net, line, or pot, our rugged fishermen bring you the freshest fish possible. Spend the day exploring the different methods our brave men and women of Alaska use to lure your meal from the ocean to the table. Commercial halibut fishermen are called "longliners" after the method used to catch bottom feeders. The long line doesn't refer to the length of line it takes to reach the bottom of the ocean, however, it refers to the miles-long ground line that is baited and then set, like a banquet, along the sea floor. Demersal fish like halibut are bottom feeders, which isn't a comment on their character so much as it is a description of where they find their food: on or near the bottom of the ocean. If you want to catch a halibut, then, you've got to set a table for them on the ocean floor. What to serve? Well, halibut are famous for eating pretty much anything that fits into their mouths – pollock, cod, sculpins – but their favorite meal is octopus. 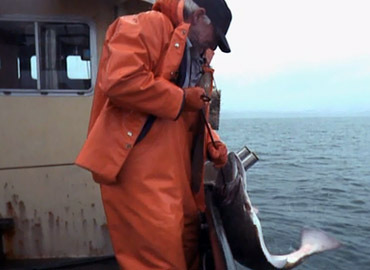 Halibut fishermen spend hours baiting, a tedious process that involves at least one 1,800-foot-long length of ground line with up to 150 hooks attached at regular intervals. This is called a "skate," several of which are often tied together to form a set that is miles long with over a thousand hooks. The hooks are attached to gangions, smaller lengths of line attached to the ground line that allow the bait to float and dance in the water just above ocean floor. Once the longliner sets his gear, he lets it soak for 8-10 hours and then enlists hydraulics to haul up his catch. Leaving the fish on the line for a while works to take the fight out of them – not something you want when you're sport fishing, necessarily, but definitely a plus when you've got to pull hundreds of very powerful fish out of the water. If they're feisty, too, it just makes the day more exhausting. Once aboard the boat, halibut are sent immediately into the icy hold until the longliner has time to bleed, gut and ice them. They are then kept at a chilly 33°F until they're delivered to the processor. Born in Ketchikan and raised on a 50-foot cruiser in Thomas Basin, Mike Jewett has been fishing nearly his whole life. "We didn't move into an actual house until I was 12," he says, from his perch in Ketchikan's famed Potlatch Bar. "We had the boat we lived on and a 32-foot double end troller that my dad fished." Jewett started trolling with his dad as soon as he was old enough to wield a gutting knife. "I'd spend all day dressing king salmon and I'd save a bucket full of guts. As soon as we got anchored up, I'd bait my hook and start jigging halibut." Pulling a 100-pound halibut up and over the side of a boat is quite a challenge for an eight-year-old, so whenever he caught a monster fish, he'd have to go and wake his dad. "He never complained," says Jewett. "He'd just say, 'Well, you got a helluva fish there, kid!' and then he'd haul it up onto the boat for me. He always gave me the money from those fish, too." Fifty years later, Jewett is still fishing for halibut. Not jigging, though. On a typical day, he'll drop a five-mile-long line with more than 2,500 baited circle hooks. After leaving the line to soak overnight, on a good day, he'll get a hundred or more fish. "I've caught as many as 8,000 lbs. in one set and there's been times I've caught nothing," he says. An anomaly in the commercial fishing industry – a longliner who fishes solo – Jewett prefers to fish without a crew for several reasons: One, he doesn't have to pay out a crew share and two, he doesn't have to deal with sorting through all the riff-raff in order to find good crewmen. "I've had guys on my boat for crew that went to prison for trying to kill people. I mean, I've had people that have bullet holes in their back and everything. I'd rather just be out there doing it by myself!" 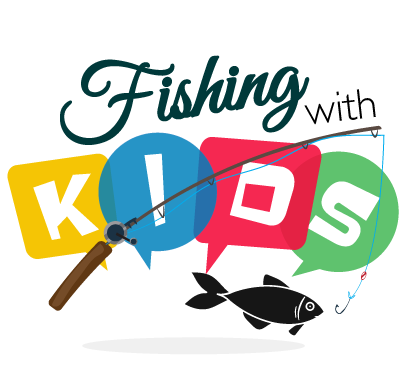 Whether the boat is a hand or a power troller, the method of fishing works the same: Leaded and lured or baited lines are dropped at intervals into the water. The lines are attached to long poles that, when lowered, extend like wings at a 45-degree angle from the boat. In the commercial fishing industry, if inheriting the family power troller is the corporate equivalent of being the boss' son, then hand trolling is like starting in the mailroom. Power trollers, which use hydraulics to reel in the fish, are expensive and the permit to run them is a steep $30,000. Because it's cost-prohibitive, young commercial fishermen without family connections usually launch their careers in a small hand troller. At any given moment, there are anywhere from 20-40 lures in the water. After the poles are dropped and both sides of the boat are fishing, the troller moves the boat slowly, about 2mph, through the water. It's important that the bait is in constant motion because trollers target king and coho salmon – non-schooling species that like to chase their prey. When the poles start to shake (or a bell attached to the top end of the tagline starts ringing), the troll fisherman knows there are fish on the line. At this point, the hand troller starts cranking up the lines by hand. The power troller simply activates the hydraulics. As each fish appears, it is stunned with a gaff hook while it's still in the water to prevent it from flopping around on the boat (a classic fish-out-of-water move that bruises the fish's flesh and damages its scales). After each fish is taken off the hook, it's bled, cleaned, gill and belly iced and kept at 33°F until it's delivered to the processor. Because of the individual attention paid to each fish, the quality of the troll catch is very high. When you grow up on the water's edge in the Salmon Capital of the World, when your first word is "fish" and your first car is actually a boat, pursuing a career in commercial fishing seems less like a choice and more like a no-brainer. Like a lot of boys who grew up in Ketchikan, Sean Hovik started fishing for little pinks off the dock on Creek Street. "I caught my first fish when I was two," he recalls, "and that was it: Ever since then, all I've wanted to do is catch more fish." He chanced upon his first commercial boat, abandoned on the side of the road when he was 12, and started his own salmon retail business and sport fishing charter, "Born and Raised (Seafoods)," just after he turned 18. These days, Hovik is a commercial hand troller and fishing charter guide who spends an average of 14 hours a day, six months a year in the hot pursuit of fish. On a typical day during peak king and silver salmon runs (April through September), Hovik leaves for the fishing grounds around 1:30am, fishes until 9am, delivers his fish to the processor, sleeps for four hours and then goes back out fishing until dark. As a hand troller, Hovik cranks all his fish up by hand, which doesn't sound like a big deal until you consider that each line is weighted by a 30-pound lead. Cranking up 30lb leads (with or without fish) is murder on the joints, even when your joints are still young and up to the challenge. For this reason, most hand trollers who wish to continue fishing commercially eventually graduate to power trolling, where fish are reeled in hydraulically. Hovik's career goals include growing his burgeoning charter business and getting a bigger, better boat with a power-trolling rig. "This is the world's best office right here," says Hovik surveying Thomas Basin and the sea beyond. "Why would I ever want to be anywhere else?" Trollers Rory and Marion Bifoss met as kids growing up in Meyer's Chuck, AK (pop. 30). "Our parents moved out there when we were kids," says Marion. "We didn't have much of a choice – but it turned out OK!" The teens, who spent their summers longlining for halibut with Marion's dad, ended up falling in love. The couple started their commercial fishing career hand trolling and hand lining from a small wooden boat. As their fortunes grew, they invested in a power troller, a boat that uses hydraulics to reel in the lines. Each season, from May to October, Rory and Marion live on their boat, the F/V Isis, and spend about 12-14 hours/day fishing. "We've never had a 9-5 job," says Marion. "We're really fortunate. We say that every day." Trollers are famous for the quality of their salmon. "First we stun the fish," says Marion, "otherwise you've got them flopping all over the place, which bruises the flesh. Then we bleed and dress them and immediately set them into a tub of ice. We want to deliver them to the processor in the best condition we can." In the winter, the Bifoss' live in a 20x24' log cabin in Alaska's remote Union Bay. During the winter, they subsist on a freezer full of salmon from the summer's catch and fresh deer meat from Rory's fall hunting trips. "We eat salmon 3-4 times a week, year-round," says Rory. Gillnetting is an interceptive method of fishing that deploys a large net with holes just big enough to ensnare a fish by its gills. It's a very sustainable way to fish because gillnetters can target the species they want simply by choosing the size of the net's mesh. One of the best ways to catch anything you're after is to know its habitual route – where it's coming from/where it's going to – and then just set a trap somewhere between Point A and Point B. This is the basic premise of gillnetting. Salmon follow distinct migratory routes on their way back to their natal streams. While gillnetters may not know exactly where the fish are coming from, they can predict ocean routes to particular salmon streams... and that is the secret to a gillnetter's success. Gillnetting is an interceptive method of fishing that deploys a large net with holes just big enough to ensnare a fish by its gills. It's a very sustainable way to fish because gillnetters can target the species they want simply by choosing the size of the net's mesh. This substantially reduces unwanted bycatch by allowing smaller sea creatures to swim on through and forcing bigger fish to simply find another way around. 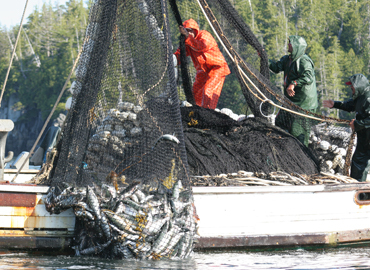 For targeted species, however – sockeye, mostly – the net takes no prisoners. Here's how it works: The gillnetter sets the net from a large drum at either the stern or the bow of the boat. Once set, the net hangs down into the water like an enormous curtain. To further confound the fish, the net is tinted to blend in with the sea. In this way, a gillnet is the nemesis of a salmon much the same as a streak-free window is to a bird: Neither of them see it coming... 'til it's way too late. After soaking the net for 30-45 minutes, or when the floats at the top of the net begin to shake, the gillnetter activates a hydraulic drum that slowly reels the net in. As the net comes out of the water, the gillnetter carefully picks each fish out of the mesh, one by one, and sends it down into the boat's hold full of icy seawater. Because there is less handling of the fish, the quality of the gillnet catch is very high. If it didn't sound so pejorative, we might say that Ole and LaDonna Gundersen are the Ken and Barbie of Ketchikan. One look at the couple, who have been married since 1986 and gillnetting together since 1988, and it's clear they could be spokesmodels for an Omega-3 campaign. "The Omega-3s found in salmon are good for your skin, your eyes, your arteries, your heart ... We eat salmon four to five times a week," says LaDonna, an accomplished cook and cookbook author whose main job on the boat, she says, is to make sure her husband is getting the nutrition he needs to live long and catch lots of fish. "If I weren't here, he'd be eating candy bars and opening up cans of Dinty Moore stew for dinner," she says, "and that's not OK with me. I cook everything we eat from scratch with no preservatives. I don't want him eating that junk; I want him to be around a long time!" LaDonna received her first cooking lessons from her mother-in-law, Kay, former proprietor of Ketchikan's beloved Kay's Kitchen. "She taught me everything I know about cooking," says LaDonna. Since then, LaDonna's cooked thousands of meals in her tiny galley kitchen and has even written a cookbook to showcase her family recipes. 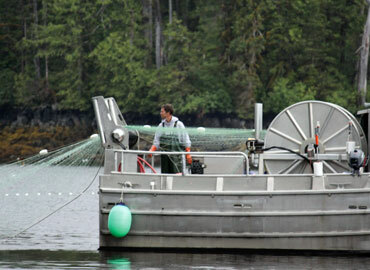 The Gundersens have made a life and a living gillnetting for salmon in Ketchikan. They live on their boat, the F/V LaDonna Rose, for the summer season, working as many as 12-14 hours a day and then spend the rest of the year travelling. "I don't know many people at our age who can have four or five months a year off," says LaDonna. "People ask us when we're going to retire and we're, like, what do you mean?" Purse seiners use a large net, which is connected to the big boat on one end and a power skiff on the other. Once a school of schooling salmon is spotted, usually thanks to one or two jumpers, the skiff driver heads off toward the beach and the captain runs the big boat out in an arc making a C-shaped set. Purse seining is sort of like corralling cattle. Blindfolded. Except you use a power skiff and a net instead of herders on horseback. Otherwise, it's really quite similar. "The fun thing about seining for pinks and humpies, is that they jump," says purse seiner Russell Cockrum. "So that's what you're looking for: a jumper. That's when you know they're there. You're also looking for which way they're jumping, which way their noses are pointed, because that's the direction they're going and you need to set in front of them." As the fish come down the beach, they start to swim in a circle inside the net. Once they're corralled, the bottom of the net is drawn together and the fish are trapped. The size of the net is regulated – no larger than 250 fathoms long and 450 meshes deep. These size restrictions ensure that the net doesn't sweep the bottom of the ocean like a trawler, disturbing the ecosystem and the marine habitat. The net's mesh size is also regulated at three-and-a-half inches for the purpose of reducing bycatch of smaller species like herring and krill. Purse seining primarily targets schooling pink and keta salmon, which are kept in chilly 33°F seawater and delivered straight to a cannery such as, Alaska General Seafoods', which sends between 13M to 27M cans/season to groceries throughout North America, Europe, Australia and New Zealand. Russell Cockrum wasn't one of those Alaskan kids who grew up wanting to be a fisherman, mainly because he couldn't stand to be out on the sea. "I had a real problem with sea sickness," he says, "which sort of ruled out fishing in my mind." His first plan was to go into law enforcement. Then he got drafted. And when he got home after three years in Vietnam, a couple of things had changed: He had a new brother-in-law who had a seine boat, his new brother-in-law was looking for crew members, and (perhaps, most importantly) there was finally a drug for motion sickness on the market. With no barriers to entry, it didn't take long for Cockrum to realize he had a real penchant for fishing. He rose in the ranks back in the day when the canneries owned the boats and would assign them to fishermen who consistently came in with the most fish. Because he was always such a highliner (someone who consistently catches boat loads of fish), Cockrum was rewarded with bigger and better boats. 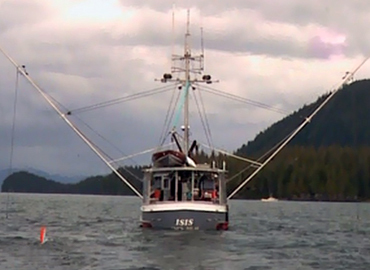 When the canneries sold the boats in 1986, he bought his current seiner, the F/V Viking Maid. "One of the things I love about being captain of a seiner is that I can give local kids jobs," he says. "It's a kind of fishing that doesn't take a bunch of training to do and it's not dangerous like crab fishing out there on the Bering Sea. I can't tell you how many kids I've put through college on this boat!" Cockrum's son, Jared, is poised to take over the business one day. "He can have it any day he wants," he says. "I just do it for the fun."